Hot time in China tonight. I know this is late but better late then never. So what i really like about this issue of Iron Man is that it's full of action. In the beginning Iron Man teams up with the Chinese super group The Dynasty to stop The Dreadnoughts. As the fighting continues Iron Man and The Dynasty learn that The Dreadnoughts are just being spent on a Kamikaze mission. The Mandarin and Zeke Stane have sent them to cause terror on Chinese soil. 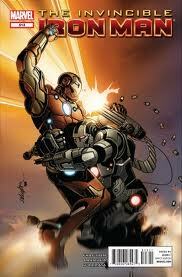 I did enjoy when Iron Man ran into War Machine turning this issue into a nice little team up book for a bit. The Dynasty tell Iron Man and War Machine to hold back and let The Dreadnoughts cause the damage that they were seeking to cause in the first place. Iron Man does come off as a little upset that they had the bad guys in their sights and just let them go. I thought that it was awesome how at the end the US Government showed up to take Iron Man into custody. Looks like Tony is going be on the run again this summer. On the flight back to the states Tony is looking at one of the heads of one of The Dreadnoughts. After some analyst he comes to the conclusion that The Mandarin and Zeke Stane are working together to take him down. The last things in this book is The Mandarin is using Zeke Stane to upgrade all of Iron Man's old villains for one large strike on our hero. While I'm really interested in the old villains getting new modern upgrades i hate the pacing of this book. It's totally written to be read in trade. Which kind of makes me want to do a trade wait on this. But to be honest if i do that then lord knows i would have stopped reading this book some time ago. Come on Matt Fraction, pick up the pace already.